The Coliiformes include six predominantly frugivorous extant species, which occur in Africa south of the Sahara. They are sparrow-sized, long-tailed birds with a short, finch-like beak and a facultatively pamprodactyl and zygodactyl foot, i.e., the first and fourth toes can be turned forward and backward. Among others (Mayr and Peters 1998), coliiform birds are further characterized by a very large dorsal cotyla of the ulna, the fact that both cnemial crests and the patellar crest of the tibiotarsus form a continuous ridge which circumscribes a groove on the cranial side of the bone, a thickened distal end of the femur with a large tubercle for the gastrocnemialis lateralis muscle, and, functionally correlated with the facultatively pamprodactyl foot, a tarsometatarsal fossa for the first meta-tarsal, which is situated on the medial surface of the tarsometatarsal shaft. Mousebirds share a derived arrangement of the tendon of the extensor digitorum longus muscle with the Psittaciformes (Berman and Raikow 1982). Some analyses of morphological data support a sister group relationship between these two taxa (Mayr 2005i; Mayr and Clarke 2003), but others do not (e.g., Livezey and Zusi 2007). Likewise, molecular analyses do not yield congruent results concerning the phyloge-netic affinities of the Coliiformes, and a sister group relationship to the Psittaciformes resulted from only one study of nuclear gene sequences (Chubb 2004). The fairly extensive Paleogene fossil record of coliiform birds shows that the extant taxa are mere relicts of a once much more diversified group. All Paleogene specimens stem from fossil sites in Europe and North America. Whereas there are several archaic forms in the early and middle Eocene, only modern-type Coliiformes are known from the late Eocene on. These morphologically distinct stem group representatives of the Coliiformes occur in the early and middle Eocene of North America and Europe. North American sand-coleids include the species Sandcoleus copiosus Houde and Olson, 1992 (early Eocene of the Willwood Formation) and Anneavis anneae Houde and Olson, 1992 (early Eocene of the Willwood Formation and the Green River Formation), as well as Uintornis lucaris Marsh, 1872, U. marionae Feduccia and Martin, 1976, Botauroides parvus Shufeldt, 1915, and Eobucco brodkorbi Feduccia and Martin, 1976 from the middle Eocene of the Bridger Formation. The fossil record of the latter four species consists of incomplete tarsometatarsi only, whereas the skeleton of S. copiosus and A. anneae is well known (Houde and Olson 1992). In Europe, sandcoleids are represented by Eoglaucidium pallas Fischer, 1987, a species which was first described as an owl and occurs in Messel and the Geisel Valley (Fischer 1987; Mayr 2002a; Mayr and Peters 1998). E. pallas and a further unnamed sandcoleid species (Mayr 2000d) are known from complete articulated skeletons, and the former is among the most abundant medium-sized birds in Messel (Fig. 16.2). Sandcoleids also occur in the early Eocene of France (Mayr and Mourer-Chauvire 2004) and the London Clay (Daniels in Table 4.1 in Feduccia 1999). The species of Sandcoleus, Anneavis, and Eoglaucidium are osteologically very similar and share robust feet and a thrush-like bill of generalized proportions. The caudal portion of the sternum exhibits a derived morphology in that the intermediate trabecles originate from the lateral ones, and the medial incisions are thus deeper than the lateral ones. In contrast to extant mousebirds, these fossil species still have a foramen for the supracoracoideus nerve on the coracoid. The tarsometatarsus has a characteristic shape, and, also in contrast to extant mousebirds, these species have a hypotarsus which bears two furrows for the deep flexor tendons of the toes, which may be closed to one or two canals (in extant Coliiformes there is only a single canal). The proximal phalanges of all anterior toes are abbreviated, whereas in extant Coliidae this is only true for the proximal phalanges of the fourth toe. The ungual pedal phalanges are very long and "raptor-like." Some specimens of A. anneae and E. pallas are preserved with feather remains and allow the recognition of a long, staggered tail similar to that of extant mouse-birds (Fig. 16.3). As in the latter, there seem to have been ten rectrices. In one Messel specimen of Eoglaucidium large seeds, probably from a species of the Annonaceae (custard apples), are preserved as stomach content (Fig. 16.2; Mayr and Peters 1998). Sandcoleidae. This species occurs in the early Eocene of the Willwood Formation, and except for the skull and tarsometatarsus all major skeletal elements were found (Houde and Olson 1992). An incomplete wing from the Fur Formation was assigned to Chascacocolius cf. oscitans by Dyke et al. (2004), and an isolated skull from Messel was tentatively referred to Chascacocolius by Mayr (2005j), and described as ?C. cacicirostris. unknown, but that of ?C. cacicirostris is very similar to that of extant passeriform caciques (Cacicus spp., Icteridae), who can forcefully open their bill within fruits (Mayr 2005j). In its postcranial features, Chascacocolius resembles another early Eocene coli-iform species, Selmes absurdipes Peters, 1999, which is known from two skeletons from Messel, a humerus from the Geisel Valley (Mayr 2001d), and a tentatively referred tarsometatarsus from an unknown locality of the Quercy fissure fillings (Mayr and Mourer-Chauvire 2004). S. absurdipes has an elongate and slender tar-sometatarsus. The trochlea for the third toe is short and wide, and in the tentatively referred Quercy specimen the single proximal vascular foramen is close to the lateral margin of the tarsometatarsal shaft, whereas it is near its medial margin in extant Coliidae. In the holotype of S. absurdipes a dense package of as yet undetermined seeds is preserved as stomach content. Because the proximal phalanges of all three anterior toes are greatly abbreviated, S. absurdipes was classified into the Sandcoleidae by Peters (1999). However, the species also exhibits the characteristic derived morphology of the pygostyle of extant Coliidae (Mayr 2001d), and as in extant Coliidae the hypotarsus includes only a single canal (Mayr and Mourer-Chauvire 2004). Phylogenetic analyses by Mayr and Mourer-Chauvire (2004) and Ksepka and Clarke (2009) support its inclusion in a clade, which also includes crown group Coliidae but not the Sandcoleidae. forward. Mayr and Peters (1998) assumed that M. brevidactylus was specialized for clinging to vertical surfaces, which also concords with its robust and stout ungual phalanges. 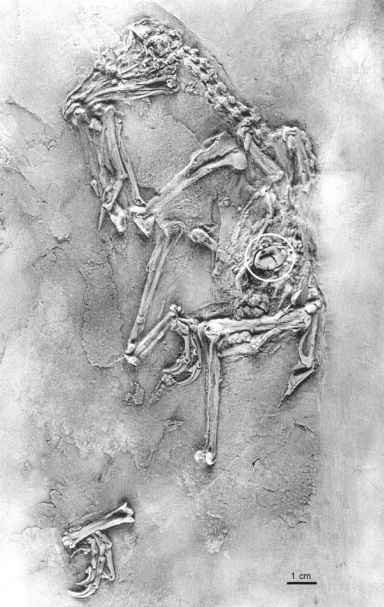 Eocolius walkeri Dyke and Waterhouse, 2001 from the London Clay is based on several isolated bones. The species lacks the enlarged dorsal condyle of the ulna, which is an apomorphy of the Coliiformes (Ksepka and Clarke 2009; contra Dyke and Waterhouse 2001). It is thus unlikely that it is a representative of the Coliiformes, from which it also differs in the shorter flexor process of the humerus. Essentially modern-type stem group representatives of the Coliidae first occur in the middle Eocene. Among these are the two species of Primocolius, P. sigei and P. minor, which were described by Mourer-Chauvire (1988a) from the middle and late Eocene of the Quercy fissure fillings. These were the first Paleogene coliiform birds recognized as such, but both are known from a few bones only (humerus, tarsometatarsus, proximal carpometacarpus). 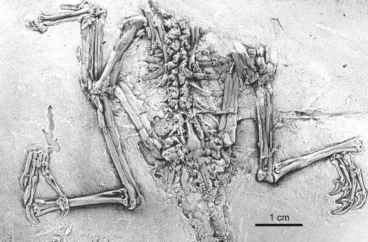 A poorly preserved skeleton from the late Eocene deposits of the Paris Gypsum probably also belongs to Primocolius (Mayr 1998b, 2000g). Most surprisingly, essentially modern-type representatives of the Coliiformes were also present in the late Eocene of North America. Palaeospiza bella Allen, 1878 from the late Eocene of the Florissant shales of Colorado, which was originally described as a passeriform bird, closely resembles P. sigei in size, limb proportions, and morphological features, such as the presence of an enlarged intermetacarpal process (Mayr 2001d). Assignment of this species to the Coliiformes was also supported by Ksepka and Clarke (2009). A fragmentary tarsometatarsus of an apparently modern-type mousebird was reported from the earliest Oligocene of Belgium (Mayr and Smith 2001). 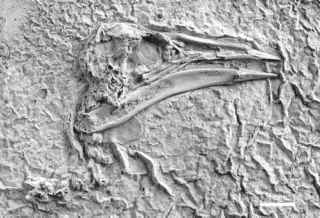 More substantial is the fossil record of a small coliiform bird from the early Oligocene of Wiesloch-Frauenweiler in Germany, which was described as Oligocolius brevitarsus by Mayr (2000g). 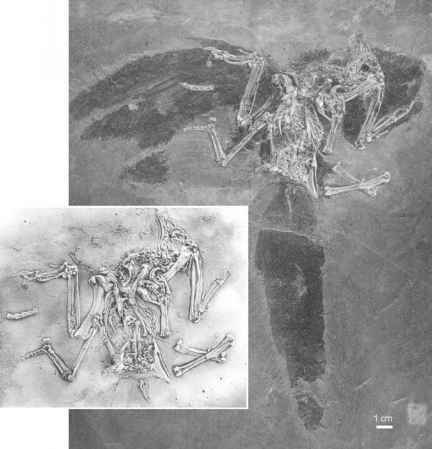 This species is known from a disarticulated post-cranial skeleton and has a proportionally more strongly developed wing and shorter tarsometatarsus than its modern relatives. In contrast to the ulna of other Coliiformes, that of O. brevitarsus distinctly exceeds the humerus in length, which may indicate that the species was adapted to a more sustained flight than extant mousebirds. 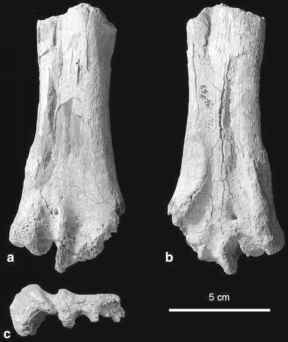 Primocolius, Palaeospiza, Oligocolius, and extant mousebirds form a clade, which is characterized by the derived presence of a well-developed intermetacarpal process on the carpometacarpus (Mourer-Chauvire 1988a; Mayr 2000g, 2001d).